It is narrated on the authority of ‘Ali, may Allaah be pleased with him, that the Prophet, sallallaahu ‘alayhi wa sallam, would wake up his family (at night for prayers and worship) in the last ten days of Ramadhaan. Benefits and rulingsFirst: The Prophet, sallallaahu ‘alayhi wa sallam, used to strive in worship. Even though Allaah The Almighty had forgiven for him his earlier and later sins, the Prophet, sallallaahu ‘alayhi wa sallam, strove his utmost during the last ten days of Ramadhaan much more than he did at any other time. Second: The Prophetic guidance during the last ten days of Ramadhaan is to spend the whole night in prayer and Thikr (remembrances and mentioning Allah), and keep aloof from women. 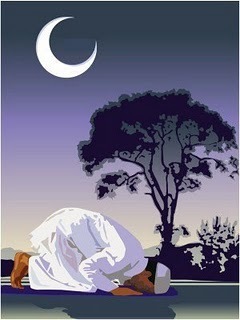 Third: It is recommended to awaken the family to perform night prayer during the last ten days of Ramadhaan. So, if the people’s habit is to remain sleepless at night in Ramadhaan, as is the case these days, let it be spent in prayer and Thikr, and not in amusement and play. Fourth: It is permissible for the man to enjoin and obligate his family and children to perform supererogatory deeds, in which it is due upon them to obey him. Fifth: It is recommended to spend the whole night, during the last ten days of Ramadhaan, in prayer and Thikr as much as possible, because this was what the Prophet, sallallaahu ‘alayhi wa sallam, did as indicated from the Hadeeths’ apparent meaning. The narrations concerning the prohibition to stand the whole night in prayer are understood to apply to doing it regularly throughout the year. However; the nights which have special excellence, like the last ten days of Ramadhaan, are exceptional. Sixth: The wisdom behind striving one’s utmost in prayer and worship during the last ten nights of Ramadhaan is to seek the Night of Al-Qadr; and it is out of the Mercy of Allaah The Almighty upon His servants that He Included it in these last ten nights: had it been any of the nights in the whole year, people would have suffered great hardship seeking it, and most of the people would have missed it.